Fisher’s Ghost Art Award 2017 Image with my Self Portrait; Artist’s Brain (Pea Brain) among the finalists. Margaret Ackland, Stephen Bird, Jacqueline Butterworth, Melissa Chalker, Joanna Cole, Lada Dedic', Amy Dynan, Angus Gardner, Rowena Grace, Vicki Grima, Megan Hales, Shaun Hayes, Dominique Hindmarsh, Ian Hobbs, Gareth Jenkins, Owen Leong, Pamela Leung, Montessa Maack, Clare Nicholson, Sophi Odling, Alison Peters, Beth Radford, Natalie Rosin, Ralph Stanton, Ingrid Wahlstrom, Val Wens and Yioryios. The Aikenhead Centre for Medical Discovery has invited artists to respond to the theme 'Art in science, science in art' by exploring the intersection between these two disciplines through the artistic medium. I am pleased to announce that 'Self Portrait Artist's Brain' has been selected to hang during Research Week at St Vincent's Hospital in Melbourne. I am excited to announce that I have partnered with .M Contemporary to exhibit the long-awaited Self Portrait Artist's Brain series. We are proudly supporting Neuroscience Research Australia and 10% of all proceeds will be donated to NeuRA. Click here to see the studio visit with Prof. George Paxinos from NeuRA where we discussed the interplay of science and art. Such fun! Running concurrently in the gallery will be the exhibition The Artists' Gaze featuring works by Sergio Hernandez, Lyndi Sales and Pamela Stretton. Please join us to celebrate the artwork and poetry from the students of Liberation Prison Project. We have a marvellous Open Day of free events planned (see schedule below) including a film screening, poetry reading and a panel discussion with some of our post-release students and mentors. This exhibition is supported by Western Sydney University Art Collection and Whitlam Institute. Reading by Robert Adamson, Australian Poet & First CAL Chair of Poetry at the University of Technology Sydney. Juno Gemes, Celebrated Australian contemporary photographer with a focus on social justice. have committed horrendous crimes, to change? A discussion on the value of meditation inside the prison walls. All proceeds from the sale of artwork go toward the important work of Liberation Prison Project. The Liberation exhibition features original works from our students in Australia, Germany, New Zealand, Thailand, the USA and Zambia. Exhibiting artists include Knut, whose work has received international awards. John is one of our Aboriginal artists and his work was presented to the Dalai Lama. Raven is a prolific artist who also holds the unique distinction of being the only FPMT Masters Program student to complete the intensive six-year study program entirely from prison. With limited resources and art supplies, the predominant medium our artists use is pen or pencil on paper. In the past, our artists have even risked punishment to send us works utilising prison property including soap sculpture and paintings on pillowslips. We receive many different styles of art from line drawings, cartoons, tattoo study pieces, collage and small sculpture. A collection of artworks is in the unconventional style of ornamented 'envelope art’ which prisoners send us with their letters. Our students send us devotional images related to their Buddhist studies and well as cartoons illustrating the prisoner experience. Making art gives our students agency to express themselves and their identity in a heavily controlled environment. A common theme from our students is wildlife, birds and butterflies. Imagery enigmatic of the struggle for a notion of freedom from within the prison walls. With tattoos being one of the main forms of art that our students are familiar with, many of the pieces we receive are tattoo studies. The prisoners offer the artwork to the Prison Project as a thank you for the support we offer. The works are for sale so the collection is always evolving. All proceeds from the sale of any artwork go toward the important work of Liberation Prison Project. and the second Saturday of each month, 11:00am – 4:00pm (excluding long weekends and public holidays). Art presents a group exhibition ‘Chaos or Control’. MERRAN ESSON’s ceramics draw from vessels in the rural landscape, inspired by her childhood in the Upper Murray. Old water tanks and buckets are recreated in bright, elegant forms, yet still retain nostalgic marks of their origin. From the two-dimensional to the sculptural, YIORYIOS creates architectural forms that bend, fold and contort. Working with bold acrylic colours and aluminium, his painterly sculptures can be seen as a form of expansive painting. Working across readymade materials and multimedia, KAI WASIKOWSKI’s latest work responds to a journey to the Southern Alps of New Zealand, disassembling backdrops of landscapes to deconstruct the romantic notion of the sublime in nature. 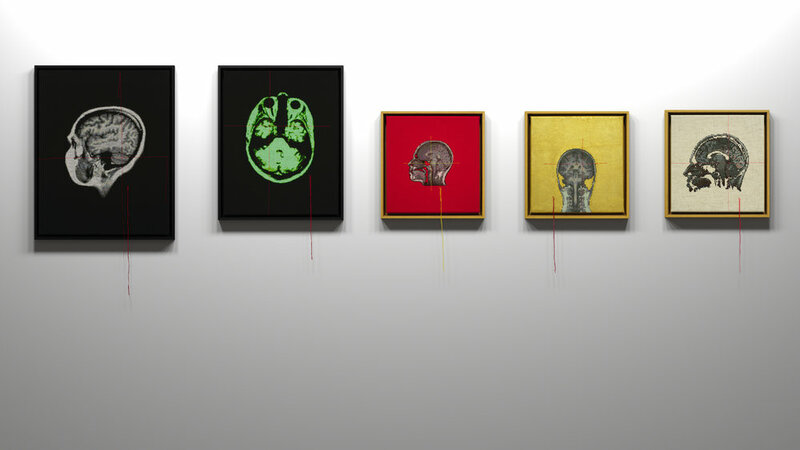 Turning to science, LADA DEDIĆ methodically cross-stitches the intricate MRI images of her brain; stitched on bright swathes of cloth they are given a new physicality. Colour grabs you when looking at the pulsating rhythm of abstract painter RALPH STANTON’s works. Non-representational STANTON is interested in space with no time. MARNIE ROSS in turn responds to light, movement and time, creating organic forms and structures that play with natural layering and evolving light patterns. MIKE BARNARD explores the relationship between ethics and aesthetics via interrogations of reality and fiction in painting, photography, sculpture, and video. GARETH JENKINS has a preoccupation with text in its handwritten and printed form. Working with collage, JENKINS layers and intertwines text on various mediums with found material to distort deconstruct the patterns of text that we have come to associate meaning with. Square One will present an exhibition of new work from a selection of artists currently residing at the studios. Running concurrently in the the upstairs gallery will be an exhibition of ceramics from former Square One residents and collected artists. I decided to make a small work specifically for this exhibition and am pleased to announce that 'Self Portrait Artist's Brain' has been selected to hang during Research Week at St Vincent's Hospital in Melbourne. I am honoured that my piece Self Portrait; Artist's Brain has been selected as a finalist in the inaugural Footscray Art Prize. Established in 2016, Footscray Art Prize is a biennial non-acquisitive visual art prize, highlighting a range of contemporary artworks from multiple platforms and disciplines. Presented by Footscray Community Arts Centre, Maribyrnong City Council, Footscray Rotary and Victoria University, the Footscray Art Prize attracted entries from diverse national and local Australian artists. I'm excited to be showing new work in the Woven Stories exhibition as part of WeAve Open Day at Parramatta Artists Studios. Discover traditional, contemporary and experimental practices in weaving, textile and fibre art. Join artists, practitioners and specialists for a day of workshops, demonstrations and talks that explore the multi-faceted world of the handmade. Experience the Woven Stories exhibition of artists in connection to WeAve Parramatta as we explore the vast skills celebrated within the group, featuring work by KC Adams (Canada), Nicole Barakat, Lada Dedic, Seinileva Huakau, Hilin Kazemi, Erna Lilje and Angela Paikea. Join artist Lada Dedic who will talk about her slow art process and lead a workshop in meditative cross stitch. Participants will receive materials to construct their own cross stitch project. The simple design will focus on rhythm and repetition. Suitable for novices through to seasoned stitchers and meditators. Please bring along any of your own projects for a show and tell. Lada is best known for the intricate cross stitched self-portraits of her own brain. She also constructs hand knitted objects and has created a number of collaborative installations which focus on viewer participation. The daughter of political refugees, Lada comes from a Croatian Catholic/Bosnian Muslim background. Now a practising Buddhist, her work is influenced by the rich history of Balkan embroidery while using contemporary techniques and imagery to explore Buddhist philosophies. WeAve Parramatta is an intercultural group that connects culturally diverse peoples through textile art, with a focus on contemporary practice by accessing traditional ways. We make beautiful things, but these are a byproduct - the really beautiful thing that happens is connection, storytelling, remembering and honouring in a supportive environment. We connect with contemporary fibre artists, provide opportunity for WeAve members to platform themselves as artists and makers, remember and honour culture and traditions, learn and share techniques, activate community and support one another. WeAve is an initiative of Parramatta Artists Studios and is supported by ArtsNSW and Parramatta City Council funding. Image: Simulation of the final project which will be completed in small sections by each participant. I am pleased to have been invited to exhibit Knitted Journal at Vivid Ideas. Please join me and the other exhibiting artists for canapés, drinks and live music… and to add a few stitches to the Knitted Journal. Exhibiting artists have responded to the theme, 'Wandering Through Place and Time' to explore moments in time that have helped shape who they are as an individual and within a community. This event is linked to Amnesty International’s Community is Everything campaign, which encourages a greater focus on directing our youth into community-led initiatives. I am currently working on an interactive installation which will be included in this exhibition. The piece will explore the role of Australian women sending care packages to loved ones serving overseas during the First World War. This exhibition brings the perspectives of contemporary artists to the role of women fighting on ‘the home front’ in World War I, reflecting on their role in society at the time, and the nature of that particular war. Though some women were involved as nurses and in other active service duties, the expected role of most was to manage the home and raise children, while dealing with shortages, their fears for the future, and the grief and trauma of losing loved ones. This exhibition will also include historical artwork and objects, and a look at the role of organisations like the Red Cross and the Country Women's Association. I am honoured that my piece Self Portrait; Artist's Brain has been selected as a finalist in The 64th Blake Prize. One of Australia’s longest standing and most historically significant art prizes.The 64th Blake Prize celebrates the diversity and aesthetic practices related to belief and non-belief within communities across Australia and internationally. The Blake Prize takes its name from William Blake, as an artist of undoubted genius, seemed to belong to no school and succeeded in integrating religious and artistic content in his work. The Prize aims to encourage contemporary artists of disparate styles, religious and spiritual allegiances to create significant works of art which engage in relevant conversations and negotiations. The 64th Blake Prize has three prize categories that challenge artists to investigate ideas, issues and engage audiences in conversations surrounding spiritual thought and religion in contemporary art. All the Blake Prize’s are strictly non-sectarian. The entries are not restricted to works related to any faith or any artistic style, but any work entered must have a recognisable religious or spiritual integrity.